Today the Church in Canada celebrates the memorial of St. Marguerite Bourgeoys, renowned for her work, her spirituality and her impact on society and the Church in North America. In 1982 Pope John Paul II canonized her and she became the first woman saint in Canada. Historically the Church celebrates the feast of the illustrious Northumbrian monk Biscop Baducing. St. Benedict Biscop, as he has come to be known, established the twin-foundation Anglo-Saxon monastery of Monkwearmouth-Jarrow Abbey. The saint caused his model monastery to be constructed with stone and glass in the Romanesque fashion (techniques and materials new to England) and furnished it with sacred pictures, service books, and a vast library collected during his five journeys to Rome. He also engaged Abbot John, Arch-cantor of St. Peter's in Rome to instruct the monks in the singing of the Roman chant. This venerable abbot sought to enrich his fellow countrymen with the finest treasures of sacred architecture, art, music, and learning from the continental Church and the Eternal City. God is your beatitude. The things of time are toys. You are eternity's child and your eternity has already begun! There is a compelling urgency to every day and every hour of the day. In it we are to witness to the truth – that God greeted and gifted us at Christmas. If you know what witness means, you understand why God brings St. Stephen, St. John, and the Holy Innocents to the crib in the cave as soon as Christ is born liturgically. To be a witness is to be a martyr. Holy Mother Church wishes us to realize that we were born in baptism to become Christ – He who was the world's outstanding Martyr. – Love Does Such Things, by Rev. M. Raymond, O.C.S.O. 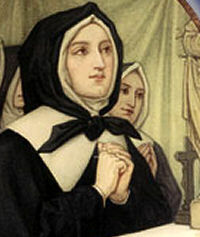 Marguerite Bourgeoys was born in Troyes, France in 1620 and died in Montreal in 1700. As one of the older girls of a Christian, middle-class family, Marguerite had to assume the responsibility for the household when her mother died. At the age of twenty, she had a conversion experience during a religious procession that profoundly influenced her future mission and focused her values. She felt singled out by the Blessed Virgin. In response, she joined a local group of women who gathered to do charitable work as an extension of a cloister in Troyes. Marguerite served as leader of this extern group and, as her service, taught the children in the poor section of town. In 1653 Paul de Maisonneuve, founder of Montreal, passed through Troyes and invited Marguerite to join him in Ville Marie as a lay teacher to instruct the children of the colonists and the Native Americans. In June 1653, she sailed from Nantes on a three-month voyage to the New World. Marguerite's humanitarian and Christian work in Canada was principally as educator and founder. The wilderness was so hard on the colonists that she had to wait for five years before children survived until school age. In the interim, she instructed the Indian children. In 1658 she opened her first school in a stone stable given her by the town leaders. Marguerite had a broad concept of education. She saw the school as a vehicle of religious and social development. Unique to her time, she provided education for all, giving special attention to girls, the poor and the natives. Education in Marguerite's schools consisted in the basics of literacy, religious instruction, home economics, and the arts. Beyond the classroom, she worked with families, assisted in faith formation in the parish, and addressed the social service needs of the colonists. Noteworthy among her contributions to the colony is the special vocational schools she established to provide the domestic skills a young woman would need to run a home in the wilderness. She became the official guardian to the "filles du roi," young orphan girls sent by the monarch to establish new families. She lodged them in her own home, served as a matchmaker, and prepared them for their new life as pioneers. Her signature appears as a witness on many of the early marriage contracts in Montreal. As a result of these activities she was affectionately referred to as "the Mother of the Colony." Marguerite made three trips back to France to recruit other women to join her in her work of education and to obtain civil approbation from the king. Marguerite's apostolic spirituality was a special gift to the Church. She was a woman of action inserted into her time as is attested to by the mark she left on the history of Montreal and education in Canada. She was a woman of faith, deeply committed to the service of the Gospels. She was personally motivated by the missionary journeying of Mary in service to her cousin, Elizabeth, and desired to form a group of uncloistered women who would imitate Mary in this mystery of the Visitation. Marguerite had an exceptional and practical love of God and neighbor. She had a great desire to serve the Church in its most local form, the parish. She exhorted her extern congregation of educators to be "daughters of the parish" - to worship with the people and use the local church as a source of spiritual nourishment. Her Congregation received Church approbation in 1698 and at that time pronounced vows as uncloistered religious. Today the Congregation de Notre Dame numbers 2600 sisters in North America, Japan, Latin America, and the Cameroons in service to the people of God in the spirit of the Visitation. On November 12, 1950 Pope Pius XII beatified Marguerite Bourgeoys. Canonizing her October 31, 1982, Pope John Paul II gave the Canadian Church its first woman saint. Patron: Against poverty; impoverishment; loss of parents; people rejected by religious orders; poverty. Say a prayer to St. Marguerite. Learn more about the congregation, Congregation of Notre Dame de Montreal, St. Marguerite founded. Read the Vatican's biography of St. Marguerite Bourgeoys. Have some fun with the family making "La tire Ste Catherine" (St. Catherine's Pull Taffy). Born in c.628 to one of Northumbria's noble families, Biscop Baducing—Benedict's original name—initially served as a thane of the local king, Oswiu. In 653 he left this service and gave up his estate to persue an interest in the church, travelling to Rome's holy sites. Northern England's Christianity derived from Irish sources and the style of church Benedict found in Rome—which formed Europe's mainstream—was quite different but evidently to his liking, because he pledged himself to it. 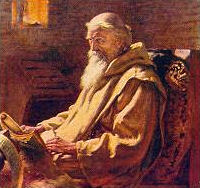 Benedict returned to Northumbria and, with a companion called Wilfrid, began promoting the Roman form of Christianity, contributing to the declaration of Oswiu in 664 which turned his kingdom from Irish to Roman forms. Benedict returned to Rome in 666 AD before joining the monastery on Lerins, an island to the south of France; it was here that Biscop Baducing changed his name to Benedict. In 668 he returned to Rome, intending to further study the ways of Roman Christianity and Monasticism. While in Rome Benedict was asked by the Pope to accompany Theodore of Tarsus to England: Theodore was both England's Archbishop and a Greek who'd never been to the island before. On their arrival in 669 Theodore appointed Benedict abbot of the Monastery of St. Peter and St. Paul in Canterbury, a position he held for two years before returning to Rome to learn yet more about Monastic practice and the mainland traditions. After returning to Northumbria in 673, Benedict secured from Oswiu's successor—King Ecgfrith—permission to found a monastery in the kingdom and a large endowment to found it on. The monastery of St. Peter was begun in Wearmouth in 674, its very structure reflecting the years of continental tradition Benedict had absorbed. Masons and glaziers were hired from France to build a stone church in a Roman style, a sharp contrast to everything in a region which built used mainly timber to build. A Benedictine rule was introduced and the books Benedict had collected in his travels formed the library, but this clearly wasn't sufficient for a man who had such experience. In 679 Benedict was back in Rome on a mission to equip his monastery with relics, art and quality manuscripts, as well as study vestments, practice and new ideas. He returned with, not only these resources, but Rome's head of liturgy to teach and privileges from the Pope. Benedict was back in England by 680. In 681 a second endowment from Ecgfrith enabled Benedict to found a twin house dedicated to St. Paul in Jarrow (also in Northumbria), prompting another journey to Rome in 682. This lasted four years and his return again enriched the houses with important manuscripts and knowledge. However, his health declined and he was bedridden from 686/687; never recovering, he died on January 12 690 AD. Benedict's role in establishing the Roman church in northern England can't be underestimated. By importing continental ideas into, and creating a considerable library and art collection for, his monastery he transformed it into a focus for brilliant scholarship which enthused the region with new thought. Indeed, one of Benedict's earliest intake, Bede, grew in these rich surroundings to become the period's greatest scholar, sending new ideas from England back into Europe. Read more about St. Benedict Biscup here.